To understand this poem, first remember that Gerard Manley Hopkins (28 July 1844 – 8 June 1889) lived in Britain before the invention of the flashlight (or “torch” as it is called in British English). 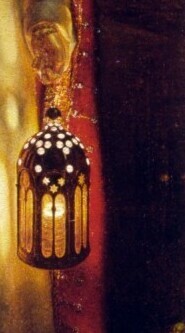 Those going about outdoors at night then used lanterns, commonly a lit candle enclosed in a framework of metal and glass, with a handle at the top by which it might be held without burning the fingers. It was a weak light, but it did the job. Hopkins encounters men who pass through his life in the same manner. They come into and out of his life either with handsome physical form (“beauty bright in mould”) or with beauty of mind, of intellect, or with some other exceptional or unusual quality (“what not else makes rare”) that causes them to stand out in our dark lives like the light of a lantern in the night. And, Hopkins laments, no matter how closely he may follow their movements with his eyes (“Wind what most I may eye after”) — like watching a passing lantern outside in the dark of night, he cannot be there after the light passes to see where they go, what becomes of them (“be in at the end I cannot”). Hopkins uses “wind” (with a long “i” here to rhyme with “mind” two lines later) to mean the movement of the eye as it follows the passing lantern. He adds the old saying, “Out of sight is out of mind.” Once they are gone, there is no more connection. He cannot go after them to see what their destination, their ultimate fate might be, he cannot be there to help or to guide or advise; they are apparently on their own on their journey. But, Hopkins the Roman Catholic convert tells us, they are not alone. He cannot go with them himself, but another does. That other is Christ. While those who pass through are lives are “out of sight” and “out of mind” once they are gone, Christ minds where they are going, Christ is interested in them. He knows what to try to accept (“avow”) in them and what needs change (“amend”). He watches them (“eyes them”), his heart longs for them (“heart wants”), his feet follow them lovingly on their journey (“foot follows kind”). He is their rescuer, their redeemer (“ransom”), and their first (both chronologically and in importance), firm (“fast”) friend in life, and also their last friend at its end and beyond. It is a rather simple little poem about Hopkins’ personal religious view that Christ accompanies people on the journey of life far better and more surely than other humans can or will, and also that he is their truest friend. So this poem is a kind of little sermon in words, but Hopkins says it so nicely (though with some cart-before-the-horse phrasing) that it does not grate on the ear as religious sermons tend to do. One always has the underlying feeling, however, that Hopkins half believes what he says in such religious verses, half tries to convince himself that what he says is true. He obviously feels that life tends to be a dark, dank, murky, uncomfortable affair, (“much thick and marsh air”), and his odd little analogy likening a stranger passing with a lantern in the outer darkness with the passage of other people through our lives is a rather pleasant one because of the simple contrast of darkness and light.